As kids grow, their prayer life needs to grow too - but how? 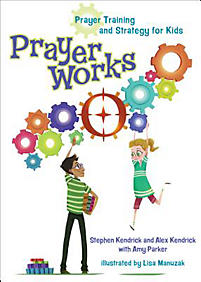 Stephen Kendrick and Alex Kendrick offer a strategy that kids can use to figure out how prayer works and just how powerful it is. Lots of great explanation is combined with fun activities, illustrations, and journaling prompts to get kids thinking "and" praying. This companion book to the movie War Room contains 32 perforated journal pages kids can use to write specific prayers and then post them on the walls in their prayer room--just like the characters in the movie. Recommended for children age 8 to 11.